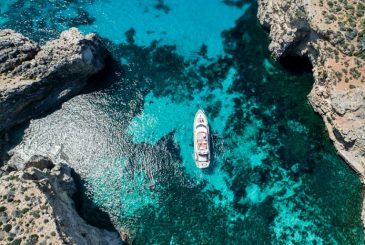 Europe and Malta’s leading luxury yacht brand, Azure Ultra keeps getting bigger and better. 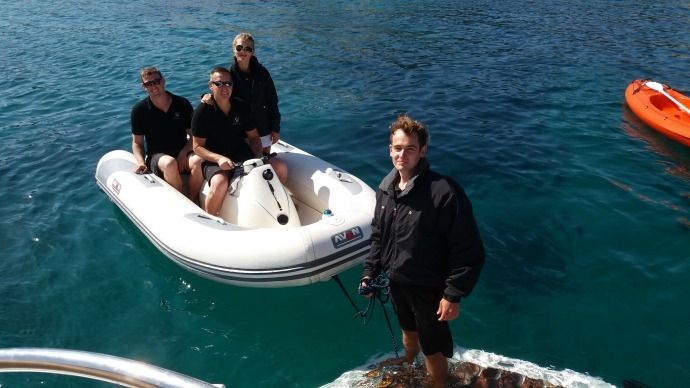 Not only have its popularity and the size of its Sunseeker fleet grown since its launch last year, but Azure Ultra has recently expanded its team with three additional crew members. Welcome on board Roxette, Luc and Dominic! Known among family and friends as Roxy, Roxette Jacobsen, 22, grew up in Durban, South Africa, where from a very early age she would spend a lot of her time at the beach. This is what sparked off a love for all things water based. After completing her diploma studies in Performing Arts in England, she worked at a resort in Greece before going on to UKSA to become a RYA Water Sports Instructor. Roxy enjoys reading, water-based activities such as sailing, surfing, windsurfing and paddle boarding, camping and all things outdoors. 22-year-old Luc Young grew up in his home town of Kloof near Durban, South Africa, which is situated in close proximity to the sea and is blessed with amazing weather. He holds a BSc degree in Systems Engineering, but claims that spending eight hours a day in an office is simply not for him. His interests include gaming, indie rock and metal music, art and photography, as well as diving and snorkelling. Dominic Hedges is 31 and hails from Brighton, England. 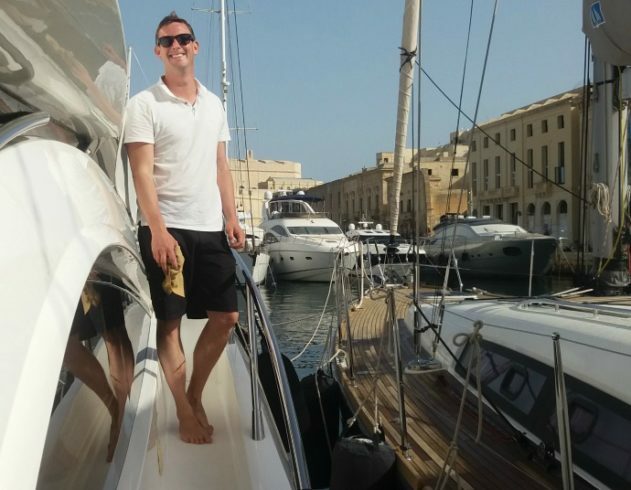 He moved to Malta six years ago to work within the yacht world, which he is greatly passionate about. When he is not doing anything boating related, Dominic enjoys playing and listening to music, reading, swimming in the summer and walking in the winter. He also loves a good film and great food. So what brings you to Malta? R. The beautiful weather all year round, and my family. L. My family primarily, and the new opportunities and experiences available here in Malta. D. My family are based here now, so when the opportunity came to work with boats – initially in Gozo, I jumped at the chance and relocated from the UK. What attracted you to the prospect of working as yacht crew with Azure Ultra? D. The high standards being set by the crew is something I always strive for. The company has gained a very good reputation on the island and I am thrilled to be part of it. L. The amazing team, exciting atmosphere and the way the company explores fun and dynamic ways to move forward. R. I really love the way the company as a whole looks after its staff and the fun working environment. Azure Ultra gives its employees the opportunity to grow and develop within the company. This has given me the chance to learn and to hopefully work my way up in future. What is your designation within Azure Ultra and what does your role entail? R. Luc and I are both employed as Deckhands/Stewards. Our role is varied and dynamic, and requires working both inside and outside on the boats. No two days are the same, which I love. D. I have joined Azure Ultra as skipper, and my role is to ensure that guests on board have the best and most unforgettable experience at sea, while ensuring their safety at all times. Dominic, what are your responsibilities, as Azure Ultra boat captain, in ensuring guests’ safety at all times? D. A proper safety briefing should always be given. I want my guests to have the most enjoyable day at sea possible, and for this to happen their safety must be prioritised. Being aware of what is happening at all times while the boat is underway or at anchor is vital. I'm also responsible for any first aid treatment needed while at sea, and I would need to follow the correct procedures in case of an emergency. Azure Ultra's new skipper Dominic giving one of our Sunseekers a final polishing. How does it feel to be working alongside Chief Stewardess Peggy and receiving instructions from Captain Roger? D. I'm confident that we will work very well together as I believe we share the same work ethics and outlook on customer service. I am happy to be working alongside a great team and learning from their experience and knowledge. L. I have learnt a lot of new things from both, and they are always so enthusiastic and exciting to work with. R. Together they have a wealth of experience and I hope to be able to learn more from them during the season. What do you think of the Sunseeker motor yachts that form part of the Azure Ultra fleet? R. I lived in Poole, the home of Sunseeker. I used to dream about working on the boats as I watched them coming out of the factory, and I just can’t believe how lucky I am to be working on such stunning boats. D. They are three very beautiful yachts. The attention to detail is incredible and the design sets them apart from other boats. L. These ladies are beautiful, luxurious and an awesome office to go to work to. Why do you enjoy boating? L. I love getting away from the concrete jungles just to be on the water and feel the constant breeze. D. I love the water and the feeling of being so connected with it while out at sea is like nothing else. R. All I can say is that it’s in my blood. How do you feel the boating experience with Azure Ultra exceeds expectations? 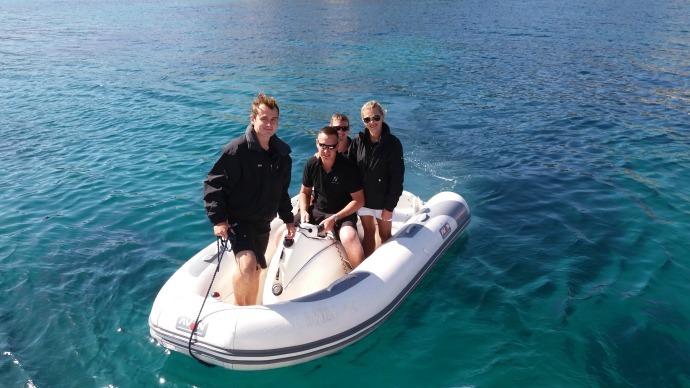 R. Apart from the luxurious boats in a gorgeous location, we pride ourselves in going that extra mile to give our guests a fabulous experience. D. The high standard of customer service along with amazing yachts and stunning surroundings make for an unforgettable experience. L. The quality of service and the way the company is always ahead with new ideas is what distinguishes Azure Ultra from all other similar operations. What does Azure Ultra offer to young, adventurous travellers within your age group? L. It certainly is a fun way to spend the day with friends, with lots of things to see around Malta and the water-based activities that go with it. R. Azure Ultra gives you the chance to experience your holiday in a new exciting way, whether it be the variety of activities or locations you gain access to. You also get to explore Malta from the sea, which is the best way. D. Azure Ultra lets you discover hidden gems, such as a pretty bay or cave; and takes you to the best places to swim and snorkel, allowing you to discover a whole new underwater world. Newly joined Deckhands/Stewards Roxy and Luc having fun exploring the Maltese coastline. 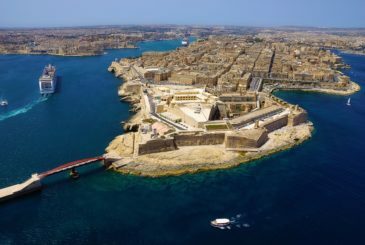 What do you recommend that guests experience while on board and while holidaying on the island of Malta? R. While on board, I suggest you try out our power dive unit, snorkelling and water skiing; or just relax with a nice drink while floating in the Mediterranean Sea. When on land, I recommend enjoying some of the fantastic nightlife Malta has to offer. Spend a day exploring the hidden caves, scuba diving, going on a historical tour, and of course enjoy a piece of the renowned Fontanella Tea Garden chocolate cake when in Mdina! L. The views on board while traversing the island are simply stunning. Ashore I would suggest exploring the Maltese architecture, fine art and street art, and partying in St Julian’s in the evenings. D. It all depends on the group and what sort of things they like to do. Some people like to relax with a glass of wine and soak up the sun, enjoying the brilliant waters of a secluded bay. Others are more adventurous and like to explore hidden caves and snorkel along the colourful reefs. On land I can direct them to my favourite sights and restaurants. What do the Maltese Islands look like, seen from the sea perspective? R. They appear like little gems rising from the turquoise waters that surround them. D. From cliffs to caves to sandy beaches, the coastline of Malta is picturesque. As you pass the northern point of Malta, you come across the tiny yet epic islands of Comino and Cominotto. The contrast between the land and the water of the Blue Lagoon is incredible. Gozo seems significantly quieter from the sea, and in winter much greener too. Sailing round to the Azure Window you will pass by cliffs that are completely breathtaking. 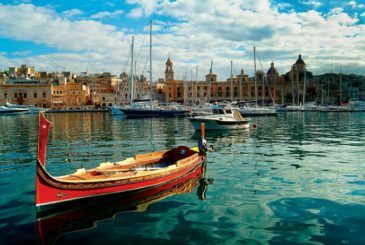 L. The Maltese Islands are extremely beautiful seen from the sea, and viewing them from one of our boats is highly advisable. The young crew members undergoing training with the experienced Captain Roger. And finally, what do you most look forward to in your new position as Azure Ultra crew member? R. I am most excited about the fact that I get to work on such fantastic boats while in the heart of the Med. I love that we never know exactly what the day may bring – this gives us plenty of opportunity to learn new fun things, and all the while providing a five-star service to our guests. L. Travelling, meeting people and having good experiences while creating a great atmosphere for on-board guests is what I greatly look forward to. D. I am in my element working with a great team of people to give our guests a truly amazing experience. We wish our new crew members a fabulously fulfilling career ahead with Azure Ultra!